@menion could the new feature #full style editor for track recording# listed in the release notes be explained please? Wow - very nice!! I have wanted more control over the line. Thanks. Hi, here a visual bug in Locus 3.23: Main menu shows duplicated Maps command, possibly it obscures former command? Interesting, how this happen? . 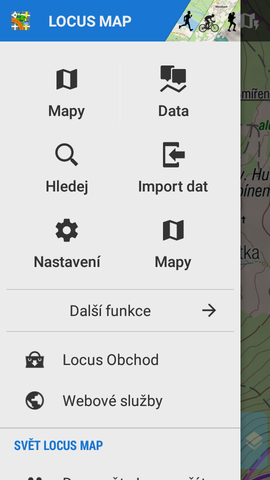 Please simply long-click on duplicate "maps" icon and choose different option as you need. ... I've just yesterday reduced font size a little, so it should help. And it's more love in "same everywhere". Dialogs usually had all uppercase, full screen not. The new beta version of me at the scale of the map does not show the number approaches. CZ: V nové beta verzi se mi u měřítka mapy nezobrazuje číslo přiblížení. Don't understand. So far, my tracks were windowtitled correctly, for example rmx_2009-08-08_MoabPorcupineRim. And now it changed to RMX_2009-08-08_MOABPORCUPINERIM. And that is better because... ? But never mind... there are far bigger issues with the whole view/edit separation mess. A little uppercasing really can't destroy much . but NEW with option "Unimportant messages also on map screen" > on/off. BTW, after update of new beta some buttons on sidepanel are gone e.g. "presets" and external app "screenrecorder"
maybe a help topic @joeloc? Microsoft Visual Studio tried All Caps font in menus a few years back, looked really ugly, and was later dropped. I do agree if I type a track name in mixed case, the window title should reflect my intention. All uppercase is ugly. Thanks @balloni55, I have really forget info about compass at into news. Therr is also a small issue in one moment of rotation, will be fixed. Notification centre will be chnaged once more so do not search for settings now. I have really forget info about compass at into news. Therr is also a small issue in one moment of rotation, will be fixed. @menion - I've noticed for quite a while that map rotation when in "auto" mode and speed is 0km/h is very "unfiltered" and often rotates wildly. When moving after setting speed, rotation with GPS is nice and smooth. Rotation with "GPS Status" app is also nice and smooth, so can't just be my phone. Is this "small issue" of compass rotation you refer to? I have a video I can upload to demonstrate problem if necessary. Hello Andrew, and we talk here about latest Beta version or about public Google Play version 3.23.0? In Beta, compass was changed once more and there happen only small issue.